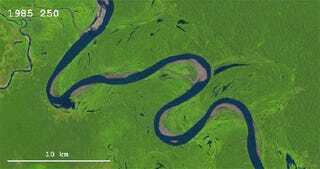 Watch as satellite imagery shows how the windy Ucayali River in Peru changed its course over the span of 25 years. The sharp bends of the original river start moving around and then even merge at some points creating a whole new pathway, while the leftover bodies of water are just put out on their own. It’s just fascinating to see how dramatically things can change.